Indiana Rep. Susan W. Brooks made a point of telling her Republican colleagues this week about several new candidates who are women and people of color. “It’s important that we, as a conference, do a better job of looking like America, and better representing the very diverse country that we have,” Brooks, the National Republican Congressional Committee’s recruitment chair, told Roll Call after Tuesday’s meeting of the GOP conference. Brooks said she told lawmakers it was important to recruit a diverse group of challengers for the 2020 election following devastating losses in 2018. She said she is well aware that just 13 of the 197 House Republicans are women and just nine are not white. Brooks said she name-checked five candidates in the meeting who recently launched their campaigns: Suzette Martinez Valladares in Californa’s 25th District and Irina Vilariño in Florida’s 26th, who are Latina; Peggy Huang in California’s 45th, who is Taiwanese American; Wesley Hunt in Texas’ 7th, who is African American; and Chele Farley in New York’s 18th District, who is a white woman. Their recent announcements are evidence of enthusiasm among diverse Republican candidates, Brooks said, adding that she has been placing “significant” emphasis on recruiting women and people of color. That has mainly involved asking congressional delegations to identify people the committee can encourage to run, particularly candidates who do not have political experience. Current and potential candidates who have been approached said they have been welcomed by members of Congress and party leaders. Angela Underwood-Jacobs, the first African American woman elected to the city council in Lancaster, California, is launching her campaign in the coming days for the state’s 25th District, which would put her in a primary against Martinez Valladares. Mike Garcia, a Navy veteran whose father is from Mexico, has also entered the race. Underwood-Jacobs said the encouragement she received from GOP lawmakers “speaks volumes” about their support for candidates of color. She has met with NRCC Chairman Tom Emmer and House Minority Leader Kevin McCarthy. 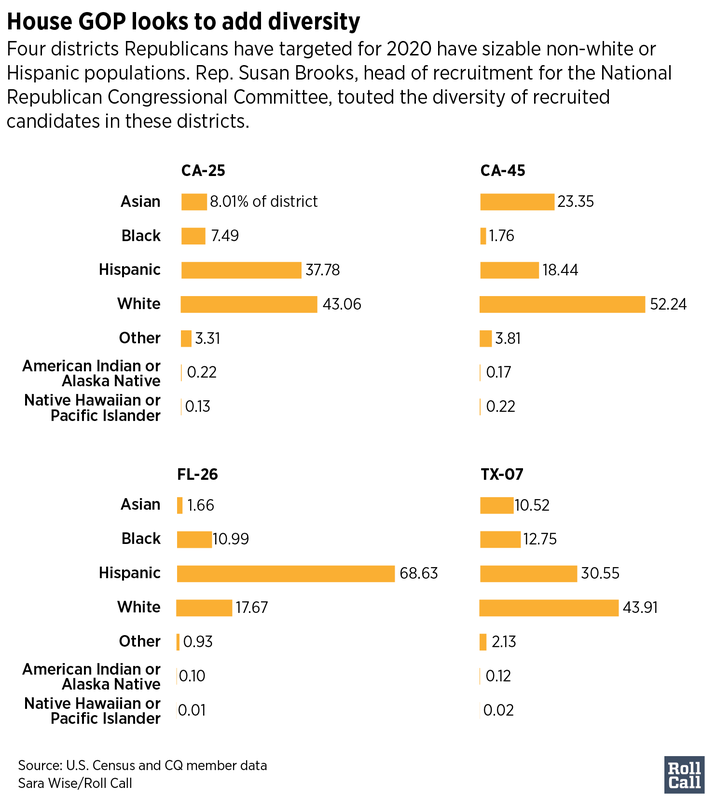 Four of the districts Brooks touted have sizable minority populations, and flipped from red to blue last fall, when Democrats captured a net of 40 seats to take the majority. The districts’ Democratic incumbents are also all women: Katie Hill in California’s 25th, Katie Porter in California’s 45th, Debbie Mucarsel-Powell in Florida’s 26th and Lizzie Fletcher in Texas’ 7th. 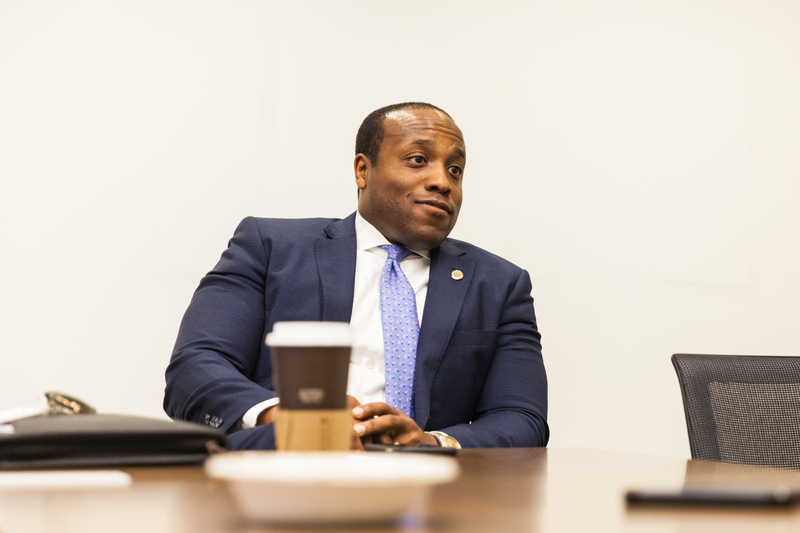 In New York’s 18th, Farley would be challenging four-term Rep. Sean Patrick Maloney. While Brooks and others are encouraging people of color to run, some of the candidates said other factors were as important in their decisions to run as diversifying the party. Valladares, a nonprofit executive and former congressional staffer, said her candidacy allows voters to elect a someone who reflects the 25th District. That’s in part because she’s Latina, like 30 percent of the population, but also because she is a mother, a woman in her 40s, and someone with experience in small business. Spokespeople for Huang, a Yorba Linda city council member, and Vilariño, a restaurateur, said diversifying the party wasn’t a factor in their decisions to run. So did Hunt, a retired Army captain, who decried so-called identity politics. But the Texan did acknowledge the significance of his candidacy as an African American Republican. “Having conservative values is not just a white person issue,” he said. The GOP acknowledged after the 2012 presidential election that it needed to improve its outreach to people of color. But Donald Trump’s use of controversial and divisive rhetoric about immigrants and minorities as a candidate and as president upended that outreach strategy, and may have fueled more diversity among Democrats. Trump’s presidency spurred many first-time Democratic candidates to run last cycle, and the new majority in the House includes record numbers of Hispanic, Asian American, Native American and African American lawmakers. “Democrats in 2018 elected the most diverse caucus in American history because we actually focused on the issues the American people care about,” said Cole Leiter, a spokesman for the Democratic Congressional Campaign Committee. Brooks did not know how many people of color the NRCC has approached about running, but she did know that the committee has spoken with 112 women interested in running. Trump’s rhetoric did not prevent the handful of candidates from jumping into House races last week. 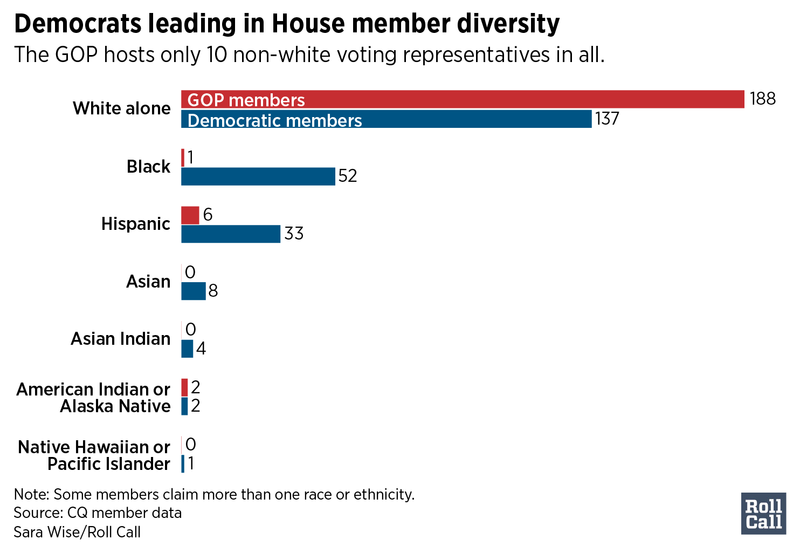 One challenge facing diverse Republican candidates is the lack of organizations devoted to diversity that also play in primaries. A former GOP hopeful recalled applying for endorsements from groups that back Hispanic candidates, only to learn that they tend to support more liberal contenders. There are no Republican groups devoted to increasing racial diversity that are comparable to the Latino Victory Fund or Collective PAC on the Democratic side. Primaries have also proved to be an obstacle, especially for GOP women. As NRCC recruitment chair in 2018, New York GOP Rep. Elise Stefanik recruited 100 women to run, but only one made it to Congress. The NRCC does not publicly take sides in a primary, so Stefanik launched her own effort to do that this year. While their main goal is boosting Republican women, Stefanik’s PAC and other women’s groups could also increase the party’s racial diversity by supporting women of color.